Semi Automatic Bottle Glue Labeling Machine for automatic sticking of paper labels on to various metal, glass or plastic bottles & cans, etc. ranging from 30 ml. to 1 liter which can be grooved or brut shaped or mineral water bottles with automatic glue application. 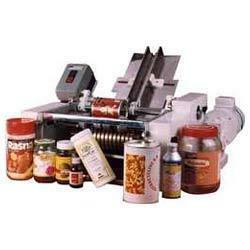 The machine has automatic feeding of label stack by slant magazine. Suitable for Pharmaceuticals, Food, Beverage, Distillery, Cosmetics, Pesticides, Chemicals, Agro Chemical and similar products.